The antique tool display in the second-floor exhibit area. 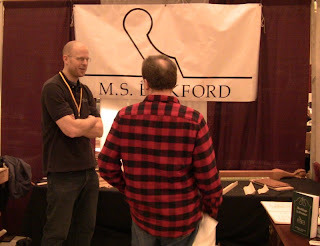 This past weekend I participated in the Northeastern Woodworking Association's Showcase 2013, in Saratoga Springs, NY. The show combines exhibitions by regional craftspeople in several categories, trade show, turning symposium, and classroom demonstrations. I gave two demonstrations each day, one on stock preparation with handplanes, and the other on making cabriole legs with hand tools. Rob Porcaro was originally scheduled to demonstrate, but he had to cancel, and suggested my name in his place. Thanks, Rob! My wife joined me and we had a great weekend, though we didn't get to see much of the area. My first responsibility as a demonstrator was to help judge the exhibition Friday night. We paired up by twos and divided the categories. 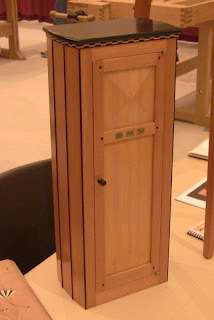 My co-judge was Peter Gedrys, an expert in finishing and restoration, with a number of articles in Fine Woodworking to his credit. He also teaches finishing classes. This turned out to be quite fortuitous. As we looked at the various pieces in the amateur categories, we discussed the finishes among other aspects. Typical for amateurs including myself, most of the finishes were pretty basic. Peter likes to get woodworkers out of their comfort zone and working with color to enhance their work. He said they only do half the project, the construction, then let it go to waste by not doing the finishing half. Don Williams, recently retired senior furniture conservator for the Smithsonian Institution’s Museum Conservation Institute, had previously told me the same thing. To give you an idea of their attitudes, Don refers to "vomiting polyurinate" all over the work, and Peter refers to it as "polygoopathane" (Don and Peter are both colorful characters, even without dyes or stains). After we completed the judging, I checked the schedule and noted that Peter's sessions interleaved with mine, so I made a note to attend both of them. The first was on using dyes to enhance color, and the second was on using shellac. I realized later that all the pieces we selected as tied for first in one furniture category and first in another exhibited the strongest color contrasts. They also showed excellent execution and craftsmanship, but clearly the coloring in details contributed to the overall effect. 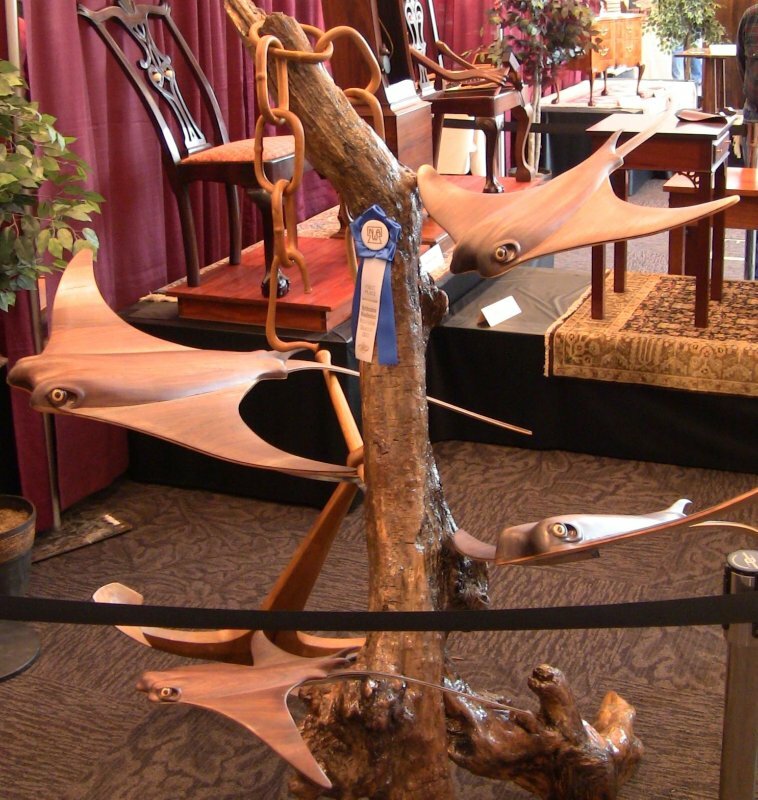 Peter and I both chose the fantastic sculptural piece below by Brad Conklin as first place in the "Other" category. The photo doesn't do it justice, but the rays were wonderfully sweeping curves. 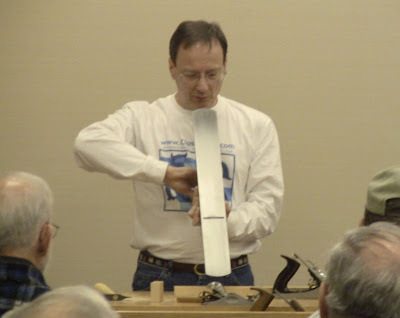 For my handplane demonstration in the morning, I first noted that I was showing just one particular way of working with planes. Other people have other ways and prefer other styles of planes. As I've said before, I'm not necessarily showing the way to work, I'm showing a way, and there are plenty of other reasonable ones. I also noted that these skills are hundreds of years old, and I'm just helping to pass them on to the next century. Most of what I know about handplanes I learned from the work of Chris Schwarz. I covered the range of plane sizes, starting with the mid-size Stanley #5 jack plane with a cambered iron for roughing, then the longer sizes for flattening (using a Lie-Nielsen #7 Jointer ) and the shorter sizes for smoothing (using a Lie-Nielsen #4 Smoother ). I also showed an antique Stanley #18 block plane, as well as a modern wooden ECE scrub plane and an antique wooden jack plane. I went through the FEWTEL sequence (Face, Edge, Width, Thickness, End, Length) to square up a rough piece. I showed how to use a shooting board on the end grain, for both square and miter ends. I told them if they didn't want to make their own like mine, they could get a nice one from Tico Vogt in the trade show. At the end I asked if anyone wanted to try the tools out, and one fellow came up and went through the process of squaring an edge and taking a rough face down to a smooth surface. Wilbur Pan was there with his son James, and after the show tweeted that thanks to my talk, James could now identify all of his planes. Thanks, Wilbur! Demonstrating how to align the iron of the #7 jointer. Photo by Cat Branam. For my cabriole leg demonstration in the afternoon, I took a squared-up mahogany leg blank and showed how to turn it into a cabriole leg completely by hand. Why do it that way? Two reasons: 1) because I can, and 2) because there are times when you may not have access to a lathe for the feet or a bandsaw for the roughing out. I showed two methods for roughing out the curves, doing one side with a full-size bowsaw and my Gramercy Tools bowsaw, and the second with a full-size antique ripsaw and a Lie-Nielsen 12" crosscut tenon saw . Then I shaped part of the pad foot with a Gramercy Tools cabinetmaker's rasp. I knew I wouldn't be able to complete it in the time available, so I borrowed a page from Roy Underhill's instructional method and had a leg already roughed out for the remainder of the demo. With the leg in my Al Breed carving vise, I used carving gouge, Lie-Nielsen spokeshave , and rasp to smooth the surfaces, fair the curves, and round the corners, finishing up with a scraper. As before, I asked if anyone wanted to try things out, and Wilbur's son enthusiastically jumped up. I pulled up my toolbox for him to stand on and he tried out the spokeshave and rasp. Roughing out a curve with a full-size bowsaw and turning blade, keeping a careful eye on the line. Photo by Cat Branam. 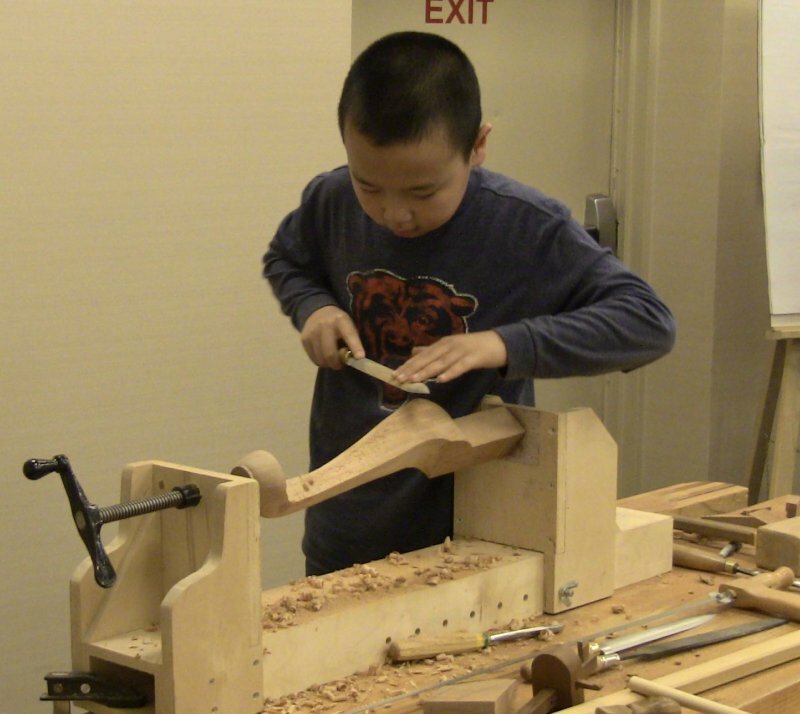 Wilbur Pan's son James rasping down a curved corner. On Sunday, Kevin, one of the participants in my classes at the New England Home Show last month, came to the cabriole leg demo bearing the gift of two six-packs of The Alchemist's Heady Topper direct from Waterbury, VT. These have been secured at an undisclosed location in my basement fridge. Peter gave two excellent demos on finishing. The first was on working with dyes to subtly color the wood. He said most woodworkers are afraid to add color, leaving the wood its natural color. Yet no one is afraid to add salt and pepper to their food to enhance the flavor. Careful use of color can similarly enhance the appearance of wood, both in tone and chatoyance (the cat's-eye effect that makes the grain pop). He said his bible is Johannes Itten's book The Art of Color, which unfortunately appears to have entered the realm of the high-end collector judging by its price. Fortunately, his later book The Elements of Color , which condenses and simplifies the earlier work, is more affordable. The key is understanding the use of complementary colors in sequence to control the tones. He demonstrated by dying a piece of mahogany with yellow mixed up from Lockwood powdered dye. This looked nice wet, but once it dried looked horrible. However, not to panic, this was just step one. He then added Lockwood antique cherry dye. The combination of yellow and warm reddish brown gave it a slight orange tone. He followed that with shellac with a little blue dye to neutralize the orange, since blue is complementary to orange on the color wheel. This produced a wonderfully warm, rich, deep, aged mahogany, the grain chatoyance flashing in the light. That was the effect he wanted us to see. He emphasized the use of "ladders", test boards where he progressively overlays layers, always leaving some from the previous stages so he can see the effect of each one in comparison with the rest. This allows him to fine tune the color before committing to it. Just as with hand-cut dovetails, practice on scrap first before trying it on a prized project. 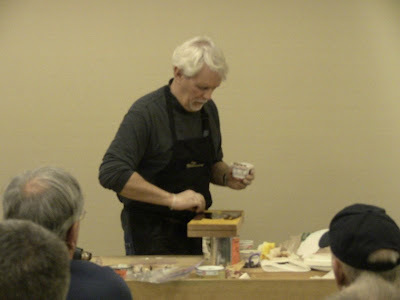 Peter's second demo was on using shellac. He showed how to add light coats of shellac with a goat hair wash brush. He also showed how to form a pad for French polishing, and demonstrated the process to build up a fine finish. I was sold. I'll be practicing both of these in the shop. The final effects drew out the grain and natural colors dramatically, like spices on food. Peter Gedrys spreading warm reddish brown dye onto yellow-dyed mahogany. 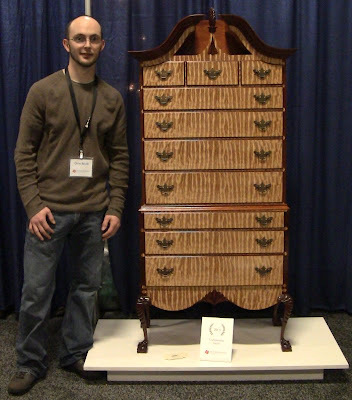 One of the professional pieces that we really liked during the judging was Don Boule's Dunlap-style highboy. Peter recognized the style before seeing the name, then realized whose piece it was. The work was incredibly crisp, with dramatic grain. 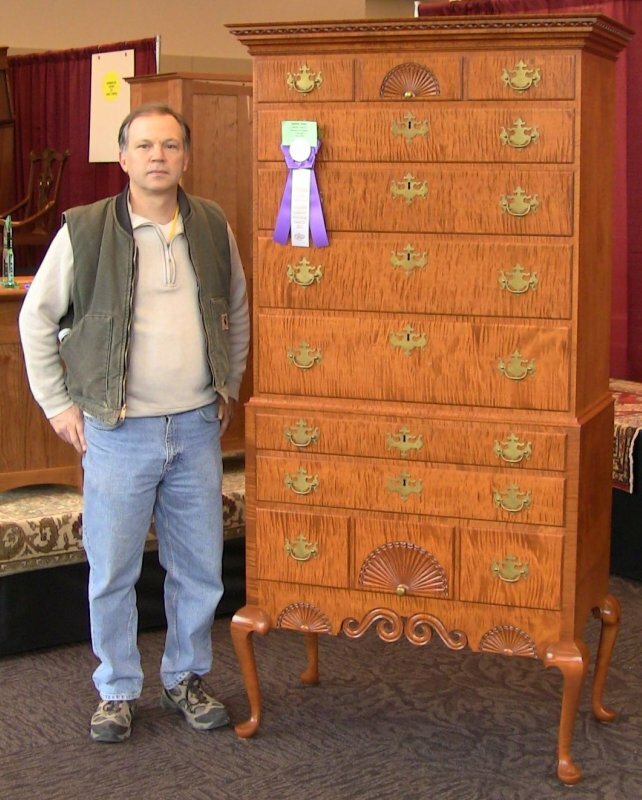 Don Boule with his tiger-maple highboy, winner of one of the professional excellence awards. The style tweaked my memory as well. Then someone said hello to me as he walked by Saturday, and I was trying to remember who he was. During Peter's class where he was joking with Don, I made the connection. It was Chris Boule, Don's son. You may remember his piece from my post on The Furniture Project at the New England Home Show. Father and son are a wonderfully talented pair. Chris Boule with his highboy at the New England Home Show, winner of that show's Best Craftsmanship Award. Note the family resemblance in the furniture. 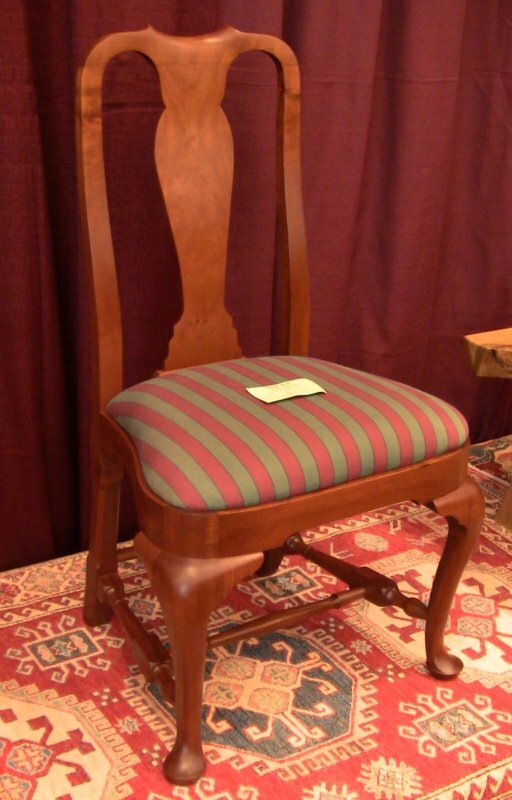 Don also had this beautiful Queen Anne side chair in the exhibition. 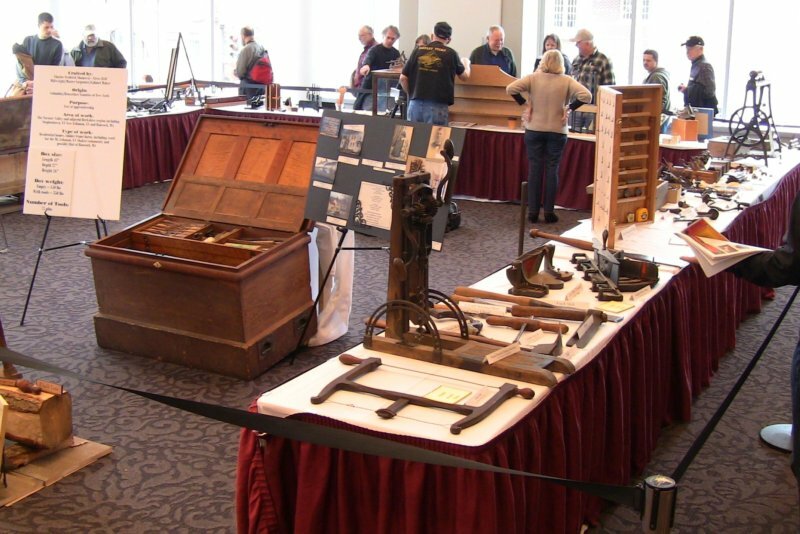 The trade show featured the usual array of power and hand tool vendors, as well as several continuous demonstration areas, and paid classes by Garrett Hack and John Wilson. I stopped by the Society of American Period Furniture Makers booth to say hello. One of the booths I liked was Dave Nilson's pole lathe. He let me try it out. It took a bit of getting used to, and his lathe chisel had a high-angle grind on it, but once I switched to left-handed, I was getting long wet shavings off a piece of green pine. 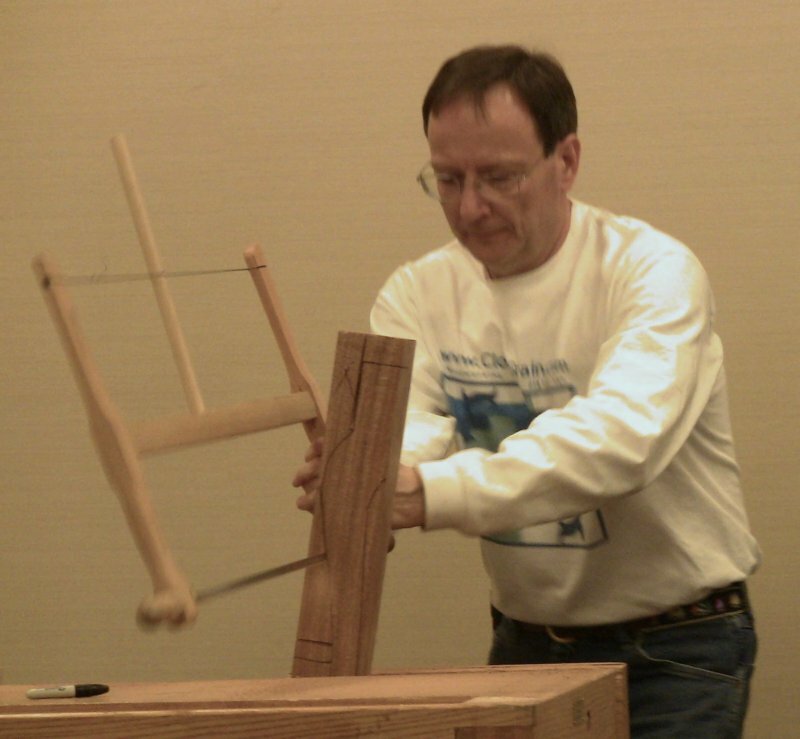 This is the same lathe in Roy Underhill's The Woodwright's Guide: Working Wood with Wedge and Edge . I really need to build one of these. Dave used it to make parts for the Onrust Project. 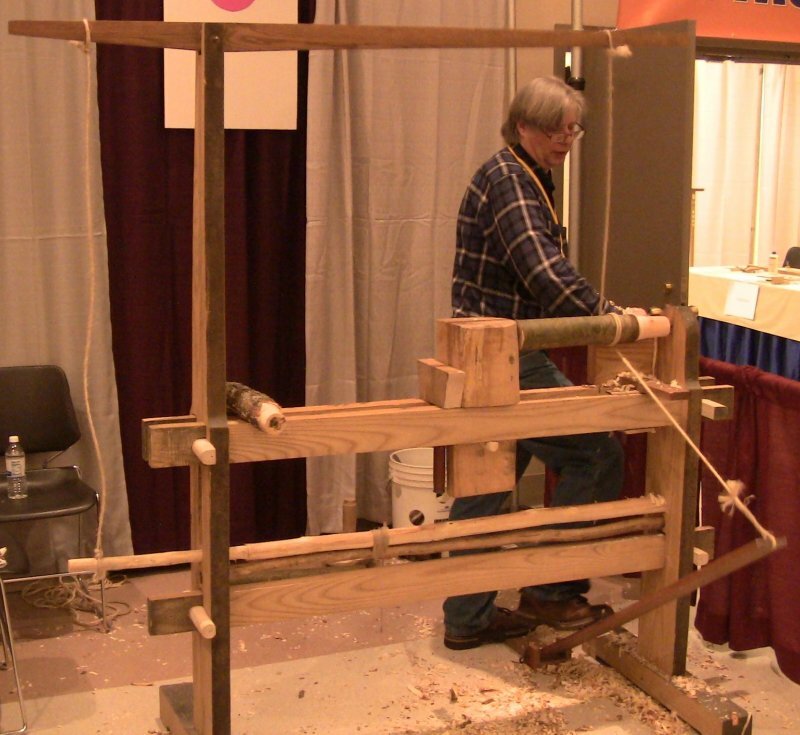 Dave Nilson on his pole lathe. 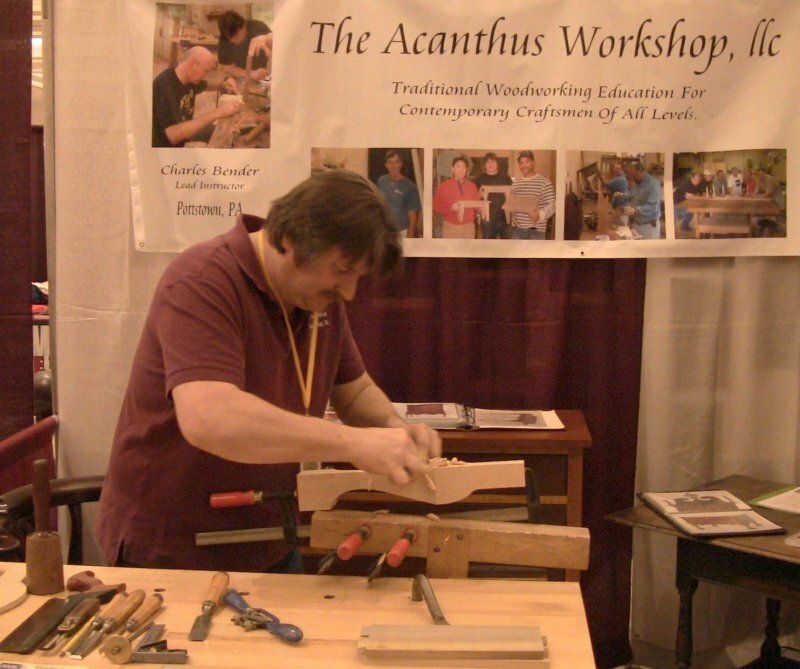 Chuck Bender was there selling DVD's and promoting his school, The Acanthus Workshop. Even though I had just given two demos on making cabriole legs, I bought a copy of his Cabriole Legs Simplified ; I'm a firm believer in learning as many approaches from as many people as possible. Even if you only end up integrating a few parts of it into your own work, it's worthwhile and improves your versatility. Chuck Bender smoothing a cabriole leg with a spokeshave. 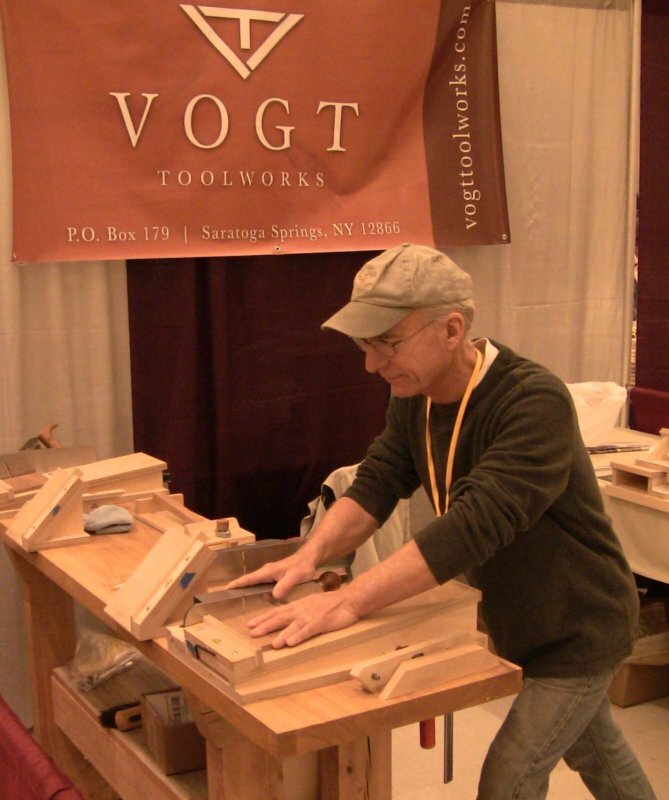 As I told people in my handplane demos, Tico Vogt was there selling his shooting boards. He had a new guide system to prevent rocking of a Lie-Nielsen shoot board plane . Tico Vogt demonstrating his shooting boards. Another vendor I really admire is Matt Bickford. He makes fantastic wooden moulding planes, and has published an excellent book on using them, Mouldings In Practice. He also had a gorgeous tilt-top pie crust table in the exhibition. Garrett Hack is one of my favorite woodworkers. He's a master of fine details. He was teaching a class on making scratch stocks and using them to do fine decorative moldings and inlays. Garrett Hack teaching his scratch stock class. 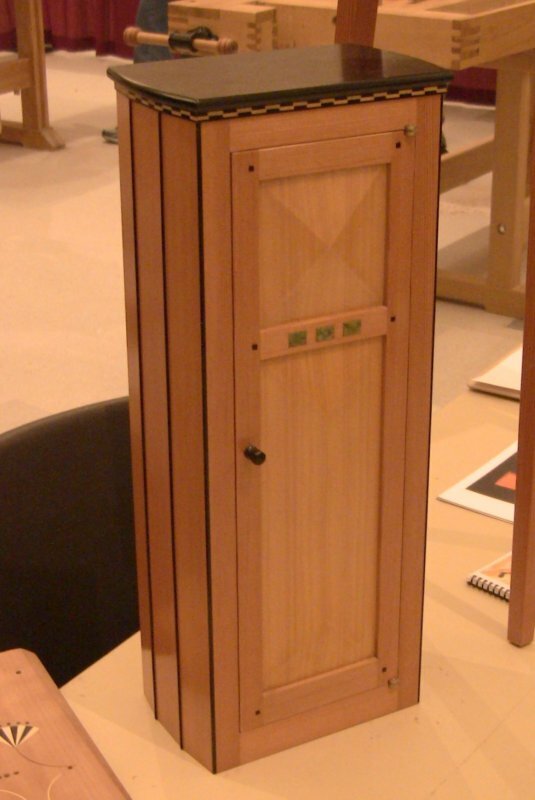 He had this beautiful small cabinet, illustrating a number of details of shape and color. Now that the show is over and I have four partially-completed mahogany cabriole legs, I guess I need to build another Queen Anne foot stool! Looks like a great show, Steve. I'm sorry I missed it. I went to the show in 2011 and really enjoyed it. Unfortunately I haven't made it to the last couple because I've been working or at school. I look forward to a few years from now when I'll have that weekend free again. Thank you for a fine write-up. As an NWA member I have attended this show yearly since 1997. And also volunteered as a worker to help staff the show. 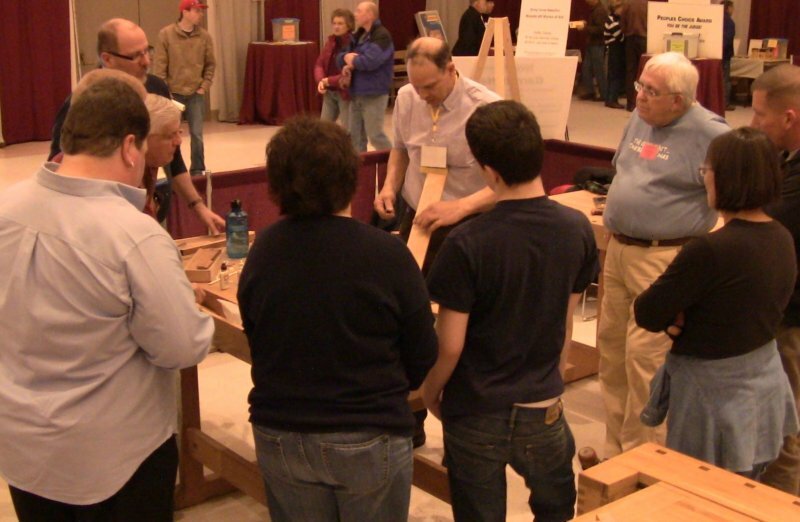 In my highly biased opinion, it is a woodworking show with great balance between displays, lectures, and vendors. We eagerly await next year!